The R16 supports up to 16 Ness radio devices and up to 15 Ness Radio Keys. All Ness supervised and encrypted radio devices are supported. There is even a Doorbell feature with selectable tunes when used with the Ness radio Doorbell transmitter. In addition to radio devices, the R16 has 1 hardwired input which operates on zone 16 and 1 hardwired tamper input. The built-in piezo siren provides high volume audible warning. The R16 also has Siren, Piezo and Strobe outputs for additional hard-wired noisemakers. The built-in dialler supports central station monitoring as well as audible monitoring to any telephone. The user can also dial into the system for remote arming and disarming over the telephone line. 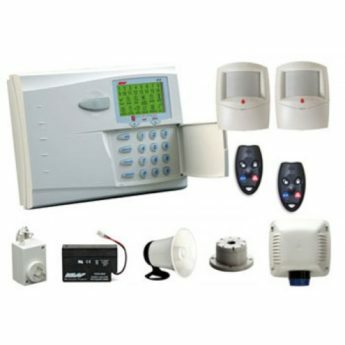 the Ness R16 Wireless Kit includes the compact all-in-one Ness R16 16 zone radio panel plus two Ness R12 Radio PIRs with wall/ceiling mounting brackets, two RK4 radio Keys and a full internal/external siren pack.